Technology and exercise? 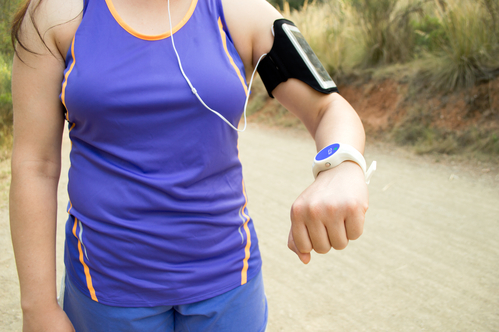 I know what you are thinking, how can I use a fitness product like a smart watch or fitness bracelet to get my child to exercise? Do I need to or am I financially able to purchase a fitness product like that? What if they don’t like it or use it and I’ve already spent the money buying it. Is there setup of the product or is it ready for use? Technology can be overwhelming but can also be very useful. The amount of fitness products out there is tremendous, but they each serve a purpose and a specific fit for someone. Today’s discussion will be on technology use during exercise but it will take a different perspective than you think. Video game systems can be a contributing factor to our kids becoming less active. It is difficult for kids to move away from technology altogether so why not make it work for us? Video game systems have games available for purchase that are fitness/exercise oriented in which the person becomes the game controller. For example, the Wii game system has: Just Dance 2016, EA Sports Active 2, and EA Sports Active NFL Training Camp. Similar game systems like the Xbox have the following games: Xbox Fitness, Nike Kinect Training, or Playfit. Lastly, the PlayStation has games like: Move Fitness, Zumba Fitness, and Sports Champions. These games use the person’s movement as a way to control the game. So, by dancing and moving you can get your kiddos to burn some calories while having fun. Cell phones currently have so many capabilities that can be used during exercise, but here is one that can help you while you are on the go. Sometimes getting out of the house is the first step to exercising, so let’s pay a visit to your local city park. Once there you can use your phone to look up some free fitness videos that can guide you through a workout without the use of any equipment. By using your own body weight you can do quite a bit of exercises, get a workout, break a sweat, and burn some calories. The cell phone can be your resource to looking up different exercises, get instruction on how to perform them, and maybe watch a video or two while you follow along. There is nothing better than the breath of fresh air, nature around you, and the birds chirping while you work out! Lastly, we have mp3 players. From Apple to HP or Sandisk, mp3 players can provide entertainment while out on a hike or walk or run. You can listen to music, an entertaining podcast, or “read” a book while you burn some calories. There are many free podcasts and audiobooks available for download that are both kid friendly and entertaining/educational. I, personally, listen to music that will keep my motivation up or catch up on a book that I have been meaning to read. Before you know it you have been walking for over 45 minutes and can mark off another workout under your belt. When listening to music make sure to be aware of your surroundings. If possible, wear one earphone in and one out of your ear so that you can constantly hear your surroundings. The best scenario is to do your walking in a park or low traffic area. Exercise is important to our health so why not make it a bit more enjoyable? Hold a Family Olympics and compete against each other during an exercise game or workout as a family at the park. Take a Sunday morning hike to prepare yourself for the week. The importance is to stay active and use technology to your advantage.